Miami-Dade commissioners voted Tuesday to let police treat marijuana possession the same way they do littering and loitering — by issuing a civil citation with a $100 fine that keeps the offense out of the criminal system. The change in county code passed 10-3, marking a milestone in how Florida's largest local government treats marijuana offenses. The new ordinance gives police officers the option of either charging pot possession as a criminal misdemeanor or as a civil offense — which brings a fine but no criminal record — for possession of 20 grams or less, enough for about three dozen joints. Slom and other backers of the ordinance emphasized that the change does not de-criminalize marijuana possession, since officers would still have the option of filing criminal charges. State and county law provides jail time and fines for possession of 20 grams or less of marijuana, and that would not change. Police director J.D. Patterson also said that smoking marijuana in public would remain a crime, and that the new ordinance would apply only to possession. But the ordinance gives police throughout Miami-Dade the non-criminal option for possession, which would bring the offender a civil citation and the required fine. The ordinance takes effect in 10 days, and applies to all Miami-Dade cities as well. 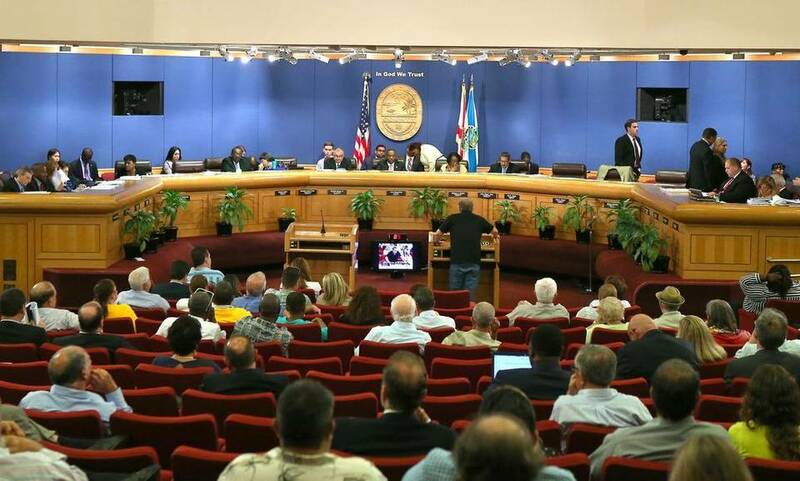 Mayor Carlos Gimenez endorsed the legislation Tuesday, calling it “good, common sense.” The police department that answers to Gimenez helped draft Heyman's proposed ordinance. Voting against the local law were commissioners Esteban “Steve” Bovo, Rebeca Sosa and Javier Souto. Senior county officials have not detailed how police would implement the new law, or when it would be appropriate to still arrest someone for possessing small amounts of marijuana. Patterson told commissioners at a hearing two weeks ago that he would encourage officers to use the criminal option when the marijuana is clearly meant to be sold or if someone was caught with pot in a car accident. On Tuesday, Patterson said department rules will offer more guidance on how the rules should be enforced, including when repeat offenders should be charged criminally. Miami-Dade's new ordinance is part of a national movement away from criminal prosecution of minor marijuana possession. In South Florida, Broward County and Miami Beach are considering similar changes.
? The misdemeanor pot arrests accounted for 10 percent of all cases filed in the criminal court system.
? County police account for 61 percent of those misdemeanor pot arrests.
? While about 20 percent of Miami-Dade's population is black, about 55 percent of the pot cases involved black defendants.
? Of the 44,860 marijuana cases closed in Miami-Dade between 2010 and 2014, only 2 percent resulted in a conviction. The change in Miami-Dade’s marijuana law was included in a larger rewrite of how to treat other minor offenses. With the new ordinance, police also would have the option of issuing $100 civil citations for loitering, littering and even possession of a plastic crate that’s registered as a dairy company’s property. The new ordinance also creates a civil citation for possession of drug paraphernalia. Commissioners also passed an implementing order that would allow people cited for a marijuana civil infraction to perform two days of community service to work off the $100 fine.